The award-winning TX-SR606 stands on top of the world with its outstanding functionality and flexibility. This A/V receiver provides high-definition video and audio processing for up to four source components-another first for Onkyo at this level. From Blu-ray Disc players and PlayStation(R) 3 to digital TV tuners, you have everything in the digital realm covered. Apart from 1080p video, the TX-SR606 will upscale to 1080i all analog video signals-from component video, S-Video, and composite video inputs-for output via HDMI(tm). 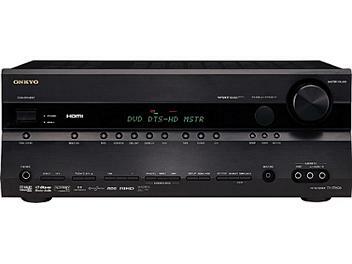 Onkyo's own RIHD also gives you inter-operability with the displays and playback components from other leading brands. And with an expanded version of Audyssey's room correction technology, the TX-SR606 maintains the fullness of surround sound audio quality at low volume levels. The TX-SR606 offers all-round excellence rarely seen at this level.